On occasion, I seek out images of Work-Life Balance (WLB), and today I decided that it was time to share some of my image-research results, inspired by assorted posts on WLB on other blogs this week (for example, here and here). Here's how it started, this image-research: Every once in a while, I encounter an image that attempts to depict the challenges of Work-Life Balance. I find most of these disturbing, disappointing, and/or bizarre. Some don't even illustrate what the accompanying text is attempting to say. 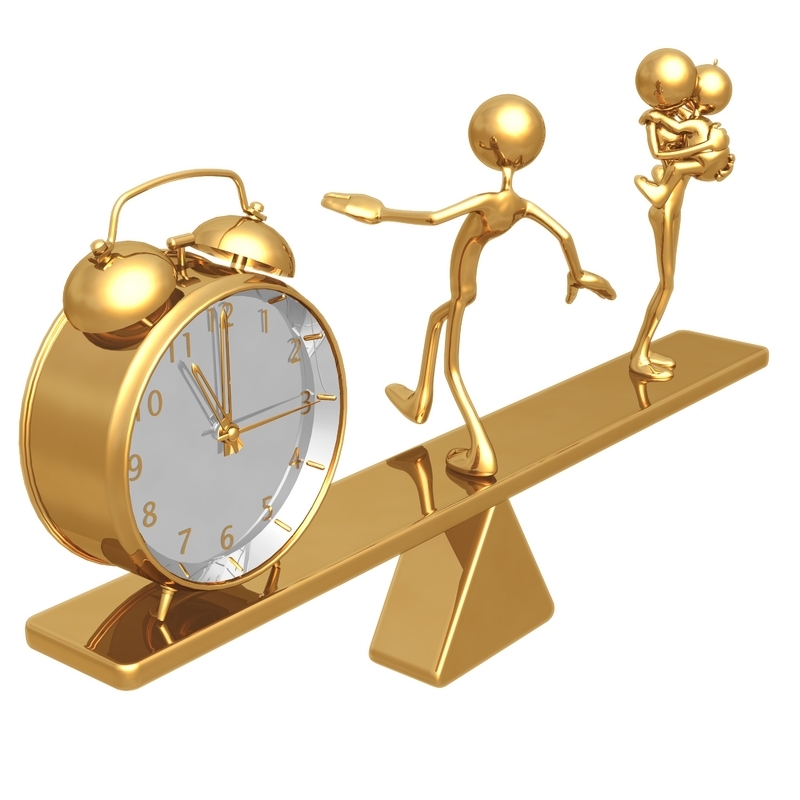 For example, if your message is that Work-Life Balance Is Possible, why show something impossible in the illustration? If you are writing about the particular difficulty of WLB for mothers with young children, why have an illustration of a frazzled man in a suit? etc. There may be a disconnect between the people doing the writing and the people providing the graphics. This is obvious from even a cursory search of WLB images. Nevertheless, I started actively searching for WLB images, for no real reason, and I have even tried to create one of my own, with less than satisfactory results. It's difficult. Clearly. rounded beach pebbles in piles or other precarious configurations. In my non-extensive, non-systematic search, I found no images with cats. I think that is worth noting. There are, however, a lot of clocks, of the old fashioned tick-tock kind, many with alarm bells. Does anyone actually like WLB images involving scales? 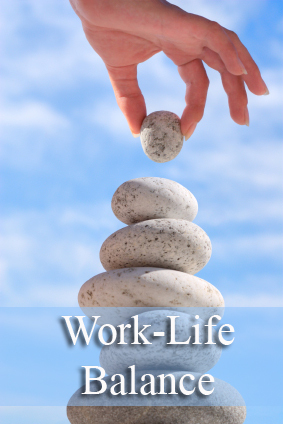 : for example, with the word "work" on one side and "life" on the other. Let's find out! A poll for choosing which of the following images you think is the best, most evocative, accurate, and/or compelling WLB image is below a series of images that I found online. The heading of each image is a link to the source of that image, and biased editorial comments are in the captions. Here is a slightly-more-interesting-than-usual example of the balance/see-saw type of WLB image. Is that a man-figure balanced between a child-clinging-to-woman-who-is-turning-away-slightly and a clock that seems to represent work? Why is the man-figure falling backwards? I personally hate this image, but don't let that influence you. Do you think this shows 11 AM or 11 PM? This one shows up in more than one place, and I'm not sure what the original source is. Again, I don't want to influence your vote or anything, but I am not fond of this one because the guy in the suit seems to be balancing a briefcase with nothing. What does that even mean? Also, the terrain is a bit flat, so I am unimpressed overall with this image. zzzzzzzz. These things almost always have a laptop and a baby. The other stuff varies: briefcases, cell phones, hobby items blah blah blah. An example of a road sign image. One bizarre thing about this one is that it is associated with the headline "Work Life Balance - Yes!". And yet, the image screams "Work or Life: You Choose, or Go In A Totally Different Direction for Balance". Or something. Ha ha ha ha ha ha ha ha ha! This may be the one I hate the most! This one tempted me to change the contest from voting on the best image to voting on the most appalling, but I decided not to 'go negative' with the contest. I hope at the very least that she is ironing her own shirt. This one isn't as bad as the typical "scale/balance" image, mostly because it asks the cosmic question: which rock = work and which rock = life? It doesn't seem to matter! This is a very positive image, even if I don't believe it is "real". More rocks! There are quite a few of these beach-pebble images, with rocks in towers, cairns, apparently precarious but structurally sound arches etc. Why?? Is it because roundish flattish pebbles such as can be found on some beaches can be balanced up to a point and that is a powerful, gender-neutral image? Whoa. The woman is balancing the kids and the man in the suit is.. what? Walking towards them to help? Is he insane? He should walk the other way or the whole thing will tip over?! This might as well be a photo of me at work when my daughter was an infant, except that computer monitors were not as flat and cell phones weren't as common and also my daughter took her work as my research assistant much more seriously than this frivolous baby and my daughter was much much cuter. Other than that, this is an inspiring photo for all professional women. 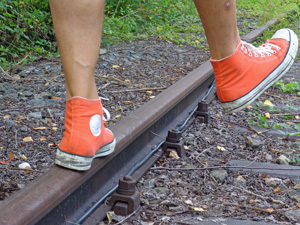 The railroad track imagery is a bit disturbing. Is there a train coming? Is this person suicidal? A dare-devil? Where is that right foot about to land? Is there a "third rail"? Is this person wearing clothes or did they forget to put them on owing to problems with work-life balance? There are of course many more image and types of images, but I think is time for reflection and voting now. You will have to decide how you define "favorite", but if the poll settings work as they should, you can vote for more than one "favorite". one of my colleagues calls it "work-life transcendence" and I'm sticking with that one. Cool competition. But just one comment on image no. 9. Other than that, this is an inspiring photo for all professional women. I know this is supposed to be taken as irony, but still, it annoys me, because many professional women, including myself, can not have children. So to read again that a picure with a baby should be inspiring to me, well, no. Just no, please. What's wrong with Venn diagrams? They're AWESOME. How else can you make Mikey Mouse math? Report the baby juggler to child protective services!!! BTW, you do know about "women laughing alone with salad", right? I have a great picture of my husband working on his laptop with our infant son sleeping across his lap and a couple scientific journals scattered on the table. 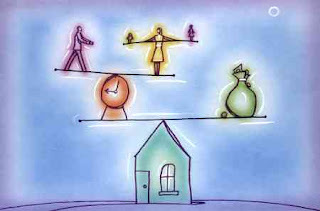 That has always been my favorite image of work+life=balance. I love your comments on each picture. Great post. As for WLB: I don't think the man is falling backward. I think he is striding forward easily, completely unaware that there is anything that needs to be balanced. I don't like #9 because the woman appears to be working at home (the fireplace in the background) - I'd prefer an image suggesting women can have work-life balance if they work outside the home too. I had to vote for 9 because I look like this very often since toddler was born. Of course there are some subtle differences such as my desk is full of papers, and my hair is normally a mess and I'm probably holding a paper instead of a phone. Also the toddler is nursing or playing with some toy or pointing at things in the screen, or stealing cereal from his father (sitting in the computer on the right) or even worse, watching a cartoon on some part of some screen. ..except that in that link, although the woman is in a suit, she may be at home or she has strange office furniture. I have also seen an image of a woman working at her desk while her baby hangs out with toys on the floor. In WLB 1, it is 11pm and the guy has obviously had too many drinks after work. A police officer (not pictured) is giving him a sobriety test and the woman with the baby is mortified. Agree with the other anon about #9. I don't think life == babies. As for #5, that would probably result in fire if I ever tried it. Although, come to think of it, I did once vainly attempt to iron my suit in a hotel room during a business trip while texting my boss about when/where to meet... Is that work/work balance? ROTFL! I want to vote on your comments, rather than the pictures! 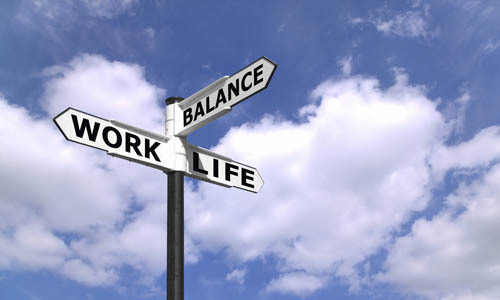 I like to think the 'life' half of work life balance need not be just babies (or ironing). Before kids I had a life, right? When the kids are older I will too? Perhaps I will become a amateur railroad track walker, in which case I vote for number 10! ‎#9 is the only positive one. But since when does work-life balance mean bringing your baby to work? Shouldn't the term imply some actual balance, like having time off to care for baby, then good daycare when you're ready to go back to work, and reasonable, predictable hours so you're home for family time? I voted for #6 because I find the image the most compelling. The idea of #9 - working on a laptop while holding a baby - is very appropriate for my life (or at least my life until recently - none of my babies are that small anymore!) but I find the picture itself much too photo-shoot perfect. The thing about all the balancing ones is that one thing goes wrong and they collapse completely. But as the post you linked to says, it's mostly picking which ball to drop on which day (for me anyway). I would prefer something more dynamic. A weeblewobble is maybe a little too punching bag like - maybe a half pipe with work on one side and life on the other - with someone doing totally rad tricks as they hurtle between the two. It feels a lot more like barely controlled careening to me, than zen like balance! How does one determine gender in #1? The adults both look identical to me. Honestly, I'd like 9 better if it showed a man with an infant. I hate the traditional implication that "babies are women's problem". As if most women were having babies on their own or something. 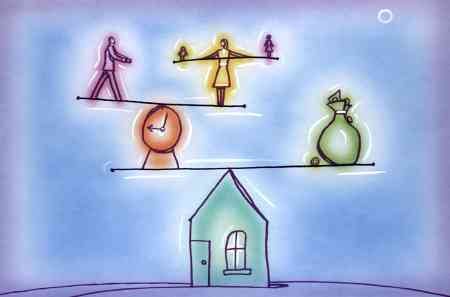 Surely work-life balance is (or should be) as much of an issue for fathers as it is for mothers? I can't decide... They're all terrible! The one with the baby at the computer isn't *so* bad though. The backwards leaning figure in the middle of #1 is obviously a man and the one holding the baby is obviously a woman -- the body shapes are different, even if they are sphere-headed cartoon people. Wow, I really hate most of these images. The scales really bother me (even the visually-appealing #6) - why should work and life be such incompatible and physical separate concepts? Isn't work a part of life and life a part of work? Maybe part of the problem is that we are creating a conflict rather than seeing life as something multifacetted with many bits to fit together? I also really think work-life balance is about much more than balancing a baby and a computer (or, ok, a job). Like several commentators I have a problem with the idea that baby=life (although I do have a child of my own). But I suppose it's better than ironing=life. Also, I really don't believe that work-life balance is or should be a woman-thing. Don't men also have jobs and lives? My husband has precisely the same challenges (and joys) in balancing work and life as I do. In WLB 1, how can you tell that this one is a male figure and that one a female? I voted for 8 strictly on the awesomeness of your description. I went with 9 just because your description made me laugh. I agree about the cats. Cat(s) = happy life. How about a cat sitting on a laptop with a spreadsheet or something behind it? My vote s for #6 (or #7) because it leaves the way people want to achieve balance up to said persons. Life does NOT equal babies. I think the comments about #1 are interesting. I thought it was obviously male center, female with baby at first glance too. But, now that I look at it more closely, the only difference that seems obvious is foot size. Clearly I have enough bias inherently in me to clearly intuit male in middle, female with child from cartoon figures. why does work ≠ life? I mean, my career is a huge part of my life - a huge part of why I love my life! I also love my sport and my child and my better half... ALL of these things are life. Right? I hate the way most of the images assume that I, a woman, must be balancing life with children. I'm not, and it's not a positive choice I made (like anonymous at 05:05 am). I'm tired of being figuratively excluded (also where are the men with children? There are men with children - literally - all over our building at the moment thanks to some local holiday, and some apparent new rule that if you're male it's FINE to bring your little kids into a science building and just have them trot around after you looking adorable and no-one will think you're unprofessional or anything (it's still not OK for the women judging by the comments being made about one person who brought her child in and - gasp! - set him up in a corner of her office with books, drink and a snack and worked from there and MADE HER GRAD STUDENTS GO TO HER OFFICE instead of her going into the lab with her child. Disgraceful). Where are the elders? I chose number 6 because it was not GENDERED and the things being balanced can be whatever you like, but I liked the one with the pile of pebbles too because it did depict the real challenge - 'just one more thing' itis! My image would have me handing the child over to the Dad while leaving for work! In #5 I think she's actually ironing a skirt, so that's something I suppose. I don't really mind the juggling depictions, although the one you showed is kinda ugly. The seesaws of all sorts are ok with me too. To the Anons asking which is male and which is female in #1: the one on the right has breasts (well one at least) - that screams female to me. Seems to have rounder hips too, but that could be my imagination. 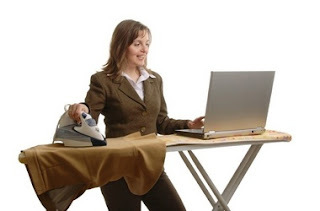 I like to believe that, in image 5, the woman is looking up proper ironing instructions on the internet. I'm glad that GMP pointed out that it was a skirt, not a shirt in #5, so I don't have to. #2 is awful, because the suited guy on the bicycle is riding no hands without a helmet—that's not balance, that's thrill seeking. I don't like any of the pictures, so I didn't vote. I agree with GMP that sleep is the essential ingredient for work-life balance. I see WLB 2 as a man riding a unicycle, trying to balance himself rather than balancing a "briefcase with nothing". In my mind he is enjoying life while on the way work - work-life integration. I am so glad some people are speaking up against this work-life balance = family/baby issues thing. As a woman without kids, I too am tired of being excluded from career discussions as if my life is a walk in the park. I have been told numerous times to my face that my productivity is to be expected since I don't have children (never mind that I have multiple disabilities and chronic illness to deal with). Many people choose to not have children for very good reasons and many cannot have them. We are already marginalized by society but now increasingly we are being shunned in academic/career settings too. I know it sucked when young women were told babies equalled career death but the new "having it all" that necessitates having kids on top of the usual career success and anything less is scoffed at is not a step forward for women. 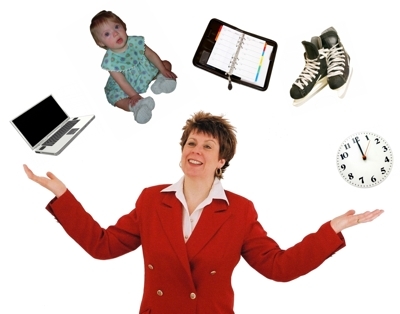 Just because someone doesn't have a baby to juggle doesn't mean they don't have challenges in work-life balance. I find it odd that people who'd like to show sensitivity to wlb issues can be so cruel as to thoughtlessly exclude people who do not or cannot have children. Thank you. Hahahaha I was also rolling on the floor reading your article, because myself too I was looking for such a picture. It's reassuring to see that some people on this earth (like you) do realize we're flood with not realistic illustrations. Very funny pictures! I agree....all terrible. My reaction to hearing "work life balance" these days is, ugh not again!!?! At my workplace, the phrase now substitutes for ALL issues that women might face at work. Thus there is no discussion of why women arent being promoted etc, there is only talk of how to give those poor women faculty more time off to raise their kids. I'm a female science prof, mid career, divorced, raising 2 kids. I can handle my work-life balance on my own, thanks. Instead, I'd like to address why I'm mysteriously not in the running for Assoc Dean of Academic affairs or Vice Dept Chair? When I complain, the guys always look at me like I have 2 heads and say that they were just considering my work life balance issues, ie they think I wouldnt have time to do anything that comes with extra work. I so wish that our faculty women's group would lay off harping on work life balance and talk about other issues facing women faculty for a change. Ladies: we are not all alike!